Gossip! is a fast-paced card game about reputations. Players spread rumours, some bad, some good, in an attempt to be seen with the most popular people. Or, even better, to become popular themselves. Timing is all-important: that guy at the other side of the table might seem like a nerd now, but he might be Mr. Perfect in just two or three turns. Playing cards can kill your reputation! The players make invitations for the players they want to make an appointment with. These are passed on to the left. Whoever gets the most invitations, becomes the most popular. In the meantime, you spread bad rumours to the right. Your neighbours are the first to hear these rumours - and they can change their plans as soon as they notice what you're up to. But who is the subject of al those rumours that are exchanged at the other side of the table? Would you lick boots along with anybody? Or would you play them all a nasty trick by spreading bad rumours in the other direction, exactly at the right moment? 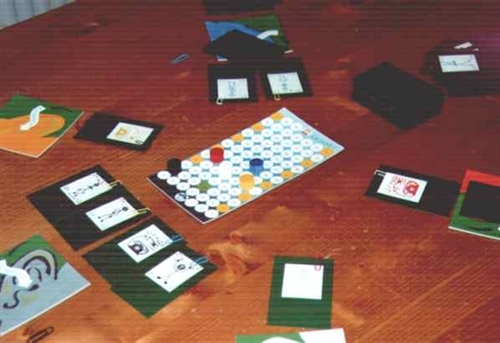 The trial edition contains 91 playing cards, a scoring board (reputation index), 6 strained ears to catch rumours in, reputation markers, 30 coloured paperclips to provide rumours with a sender, and rules in three languages (Dutch, German, English). This trial edition has been sold out.